I wish I would have just bought these shocks 2 1/2 years ago. It would have saved me a lot of money. I have only adjusted the high speed compression 1/2 turn in since installation. I am no longer afraid of missing a landing on doubles and table tops. No more death grip is needed through whoop sections. I actually find myself looking forward to the long whoop sections. Missed gears are a thing of the past. The bike stays straight and the front stays level under hard acceleration,making hole shots very do able. Also contributing to the handling is the cartridge emulators in the forks.It has renewed my confidence in myself on the track. I feel more at home on a mx track with the 76 250 than the 2007 KTM XC. The weak point of the 76 is the large space between gears. I would recomend these shocks to anyone who wants to enjoy riding an older bike on a modern type man-made track. Most importantly they made the bike much safer to ride. "Just wanted to give you some feedback on the 1981 YZ465 you set up for Steve Marquez. It's one of the best suspensions I've ever been on. It worked better then a new stock 450 four stroke. The limiting factor on how fast I could go was not the suspension it was the brakes. The brakes could not keep up with the suspension. This bike is big fun to ride, thanks and keep up the awesome job." "I want to take a short moment of your time to thank you and your team for making my experience with Race Tech to be extreamly positive. 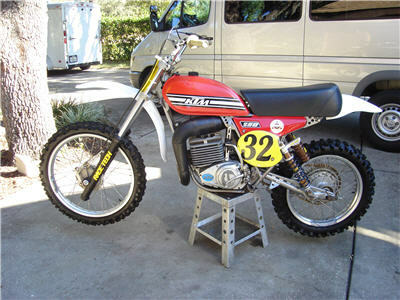 Matt, Michelle and Louie were tremendously responsive with me on my oddbal emulator project for a Vintage Maico. Technical support provided was accurate and superb. Customer support for shipping replacement parts, RGAs and handling credits was fast and efficient. I know from first hand expereince of managing very busy customer and technical service teams how much of a challenge it can be to keep 100% of the customer 100% satisfied. And as a consumer, it seems less than acceptable customer support is the norm. You and your team have done a great job in providing top notch service. I have been promoting your excellent service in the niche vintage MX & street bike communities I am active in. And heck, this weekend will be my first time to flog the emulators! Faster lap times will be the icing on the cake!" "Again, just wanted to let you know my appreciate of the strong team you have."